NORTHAMPTON - A couple blocks from the popular cafe Northampton Coffee, a flock of runner ducks putter around inside a pen. In a nearby field, close to a pair of soccer nets, asparagus rhizomes and a sour cherry sapling grow. Kids run around a geodesic dome-shaped jungle gym. This is Town Farm, run by Ben James and Oona Coy within Northampton city limits. Now in its second year, the farm is springing to life with freshly hatched chicks, Nubian goat kids, and a greenhouse full of vegetable seedlings. Coy is expecting the couple's second child this season. Their tractors are geared up for roto-tilling and seeding and two bike trailers for trucking produce to a new farmers' market in town are stored in their distribution shed. It's the shed where local residents pick up their Community Supported Agriculture fruits and vegetables. This season, the couple plan to grow enough organic vegetables to hand out to their 75 CSA shareholders and also have some to sell at a farmers' market the two helped start. They're also hoping to cultivate a neighborhood feel, where CSA members can walk or bike to pickups, which will distinguish them from the Pioneer Valley's many other rural farms. "The single thing I want to see is more people getting their food from within a quarter mile of where they live," James says. "The vast majority of people in this town still get their food from California and Argentina and wherever. The idea is that food is right here and it doesn't need to be transported." Coy checks on her goats as her husband and farming partner rides his bike home from a quick trip into town. In the dirt driveway to their farm, the couple meets up with another farmer, David Fisher, who came down from Conway to drop off the first of the season's wild leeks. "Things are looking awesome," Fisher says. "Keep it up. If you guys ever need a hand with projects, just let me know." Town Farm uses two pieces of land on either side of an earthen dike protecting the city from floods on the meandering Connecticut River. On one side of the dike is noisy traffic from I-91 and the Great Meadows, a fertile floodplain once farmed communally by early settlers and now planted with hundreds of acres of conventionally grown corn. The other side is a dense suburban neighborhood, where cats skulking along the hedges are as common a sight as soccer balls. "This is sort of what our farm is about - being in this funny, liminal zone between highway and town and dike," Coy says. As such, James and Coy cultivate a middle ground. One of their neighbors, Montview Neighborhood Farm, offers CSA shares all grown by hand without a tractor. Over the dike, larger, conventional farmers plant corn with mechanical seed planters and commercial fertilizers. Town Farm also seems to distance itself from the 1960s and '70s back-to-the-land generation from New York and Boston who moved to the hill towns around the Pioneer Valley to become homesteaders. James says they deliberately chose to live and farm closer to the rest of the world and the amenities of cafes, coffee shops, and, of course, urbane consumers of organic food. They didn't start out as town farmers. James grew up in Louisville, Ky., Detroit, and New York. Coy was raised in the suburbs of Connecticut. Five years ago, after college and jobs on various farms, the two bought a house in Northampton with the idea of homesteading and doing other things for pay (James writes fiction and taught at Hampshire College; Coy worked on other farms). 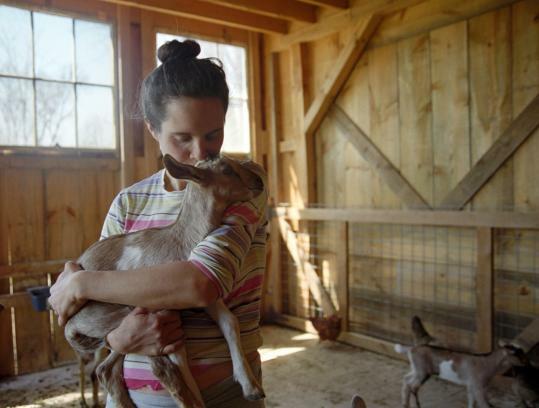 The couple raised two dairy goats on a postage stamp of land behind their house and for a while, they tried selling raw milk, although Massachusetts laws made commercial and legal production prohibitive. "At a certain point, I wanted to be on my own farm," Coy says. "Ben wanted to be in town. He wanted to be able to walk places and bike places. He didn't want us to live in our cars." When a potato storage barn down the street from their old house was sold to a housing developer, some neighbors rallied to preserve the barn's agricultural character. Eventually the two decided they could develop the barn with solar panels and water catchments. They put in a parking lot and began acquiring surrounding land. Money from Coy's family enabled them to buy the land, some tractors, and invest in infrastructure, often a major hurdle for first-generation farmers. The couple has also set up a Tuesday evening farmers' market with other new farmers; they hope their business will be an incubator for others who wish to stay in town. And now that they've begun to live and work on a neighborhood farm, James says the most important thing for him has been letting Silas, their 3-year-old son, explore his surroundings. "For our kids growing up and having free roam is just a huge part of my whole desire for this setup," he says. Town Farm, Venture's Field Road (corner of Henry Street and Mont View Avenue), Northampton, 413-586-7586, www.nohotownfarm.com.